This article is about Olimar's appearance in Super Smash Bros. 4. For other uses, see Captain Olimar and Pikmin (species). Olimar (ピクミン＆オリマー, Pikmin & Olimar) is a playable character in Super Smash Bros. 4. His return to the series was announced in a Director's Room Miiverse post on July 12th, 2013, which also commemorated Pikmin 3 being released in Japan on the following day. Alph, one of the three leaders in Pikmin 3, was revealed as an alternate costume in a Director's Room Miiverse post on September 11, 2014. Olimar is currently ranked 21st out of 58 on the tier list, placing him at the top of the C tier. This is a significant drop from his top-tier placement in Super Smash Bros. Brawl, where he was ranked 3rd out of 38. As in Brawl, Olimar's Pikmin possess an impressive level of utility: they grant him respectable KO and damage racking potentials, as Olimar can use them to deal direct and/or indirect damage via his standard moves, and by having the Pikmin latch onto opponents via Pikmin Throw, respectively. The Pikmin also grant Olimar a potent grab game: each of them function as disjointed grabs; White Pikmin-based pummel is tied with Shulk's Buster-boosted pummel as the most damaging in the game; Blue Pikmin-based up throw is a viable KOing option at high percents; and Red Pikmin-based down throw is a very reliable combo starter even at high percents. Lastly, Winged Pikmin function as a maneuverable, flight-based recovery that can be used regardless of whether or not Olimar has Pikmin, which makes them vastly superior to Pikmin Chain's tether-based recovery. However, Olimar's active Pikmin count has now been halved from six to three, which severely weakens the camping strategies he relied on in Brawl. The Pikmin themselves have also been weakened in a few, yet noticeable ways. Red, Yellow, Blue, and Purple Pikmin have less hit points, which is further compounded by them and White Pikmin dying faster while separated from Olimar. Each type of Pikmin have also had the majority of their damage outputs lowered, and suffer from somewhat flawed artificial intelligence. In comparison, Olimar retains his slow overall mobility; his aerial mobility is particularly problematic, as it renders him susceptible to juggling in spite of his light weight. By extension, his offense is still burdened by slow attack speed and an over-reliance on Pikmin. Overall, Olimar has achieved impressive results at all levels of competitive play, even in spite of his retained and newfound weaknesses. Olimar is a lightweight with overall slow mobility. However, his air acceleration and traction are both above-average, while his jump and double jump are both average. Olimar's playstyle is almost identical to how it was in Brawl: he has retained the overwhelming majority of his moveset and animations, yet some moves have been slightly modified. Much like in his home series, Olimar's extremely meager offensive prowess forces him to rely on instructing his multicolored Pikmin to remedy this glaring flaw. As a result, almost all of his moves involve Pikmin; this, in turn, can result in his moveset being useful or useless depending on whether or not he has Pikmin. When Olimar has Pikmin, he possesses arguably one of the most unique playstyles in the game, thanks to the Pikmin functioning as both projectiles and separate characters, much like how Luma functions alongside Rosalina. When used correctly, the Pikmin provide noticeable and effective benefits: they can easily rack up high amounts of damage in short periods of time, they grant Olimar disjointed grabs by running out to grab opponents at any time, they can carry various items back to Olimar as they run back to him much like in their home series, and they can also help with camping or hindering approaches. Additionally, each type of Pikmin provides unique and useful effects. Olimar's special moves are also heavily dependent on Pikmin, but they are all beneficial nonetheless. Pikmin Throw enables him to hinder approaches or, with a Purple Pikmin, even stop them outright if they are not shielded. Pikmin Order reorganizes his Pikmin for the proper situation at hand, and thanks to it briefly granting super armor, it can even allow Olimar to briefly tank an attack in spite of his light weight. Lastly, Winged Pikmin are very versatile: they provide a long-distanced and maneuverable recovery that makes Olimar more difficult to KO compared to other lightweights, yet they also allow him to attack while they are carrying him. With all things considered, Olimar has one of the most damaging playstyles among the cast, as he is able to KO nearly any character in a short period when his Pikmin are utilized wisely. For example, Pikmin Throw allots him a large array of options for offense, as it can both zone and get opponents to KO percents quickly; when the thrown Pikmin are not shaken off, they can rack up 10%-30% in a matter of seconds, forcing opponents to carefully plan their approach. Olimar can also have up to three Pikmin at a time in his lineup, which, despite its aforementioned halving since Brawl, can be hard for an opponent to keep track of, especially with each color boasting unique attributes. Despite being a lightweight, his smash attacks are fairly fast and, while using Red and Purple Pikmin, boast impressive power. Olimar's disjointed grab range also enables him to disrupt the movements of quick characters or roll spammers. When coupled with his above-average traction, this also grants him an excellent shield grab. Olimar's air game is also quite powerful: neutral aerial is a reliable combo starter when SHFF'd; up aerial is useful for juggling, and can even KO outright while near the upper blast line; forward aerial is useful for approaching and edge-guarding; back aerial is useful for edge-guarding, and can even KO outright while near the edge or the left/right blast line; and down aerial is a powerful meteor smash against aerial opponents during its first frame. However, Pikmin can also double as a drawback: due to being treated as projectiles, they can be reflected, which can sometimes hinder Olimar's offense against characters with moves of this sort. However, Olimar has noticeable flaws. One of his greatest weaknesses is that he struggles against fast characters, such as Sonic and Captain Falcon. As Olimar is a slow character, they can easily catch up and punish him if he tries to retreat to pluck more Pikmin. Due to all but White Pikmin having less hit points than in Brawl, they are also susceptible to dying faster. Olimar also has poor aerial mobility, as his slow air and falling speeds make him easy to juggle and, when coupled with his light weight, to KO. This is further compounded by his Pikmin-based aerials being burdened with low priority, which makes them extremely difficult to use against edge-guarders. Another severe flaw he has is his over-reliance on Pikmin, much like in his home series. Without any Pikmin, Olimar's smash attacks, up, down, back, and forward aerials, grabs and side special will simply do nothing, which significantly harms his neutral game because of them being his most effective attacks. This also leaves Olimar with a total of six moves that deal damage: his neutral attack; tilt attacks; dash attack; and neutral aerial. This, in turn, is further compounded by his forward tilt being the only move out of these that has KO potential. As a result, it is crucial that Olimar has at least one Pikmin with him at all times. Lastly, some of Olimar's useful Pikmin-based attacks have certain drawbacks: his KOing options have very minimal KO potential while using White Pikmin; each of his grabs have noticeably shorter ranges while using Purple Pikmin; up throw has KO potential only while using Blue Pikmin; down throw's combo potential is consistent at high percents only while using Red Pikmin; and Winged Pikmin's recovery potential worsens when they are used too frequently. Olimar has a few beneficial custom moves. Hardy Pikmin Pluck makes all types of Pikmin more durable at the cost of being plucked slower. Sticky Pikmin Throw has each Pikmin deal less damage and cover less distance when thrown, but they stay latched on for much longer and deal damage at a faster rate. True to its name, Tackle Pikmin Throw makes Red, Yellow, Blue, and White Pikmin function like Purple Pikmin by tackling opponents instead of latching onto them. Mighty Winged Pikmin have reduced total travel distance, but the distance is not affected by the amount of Pikmin that Olimar is carrying. Lastly, Order Tackle has all latched on Pikmin deal damage upon being recalled, which grants Olimar another way to deal damage. 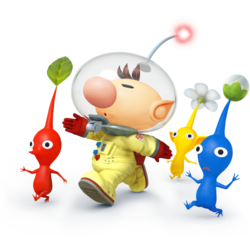 Overall, Olimar still retains many of his considerable strengths in spite of their nerfs, and has even had some traits buffed, mostly in regard to his damage output. While his potential damage output was reduced, a smart player can overcome this, especially with the new mechanics for keeping track of Pikmin, making Olimar a much more reliable character for the player. Olimar's recovery has also been completely revamped for the better, which is generally agreed to have alleviated his other changes. Early in the metagame, Olimar was thought to be one of the worst characters, yet dedicated mains such as Dabuz, ImHip, Angbad, Myran, and Logic have shown that, as in Brawl, he is still a very capable character who retains a very high learning curve. Olimar has been nerfed in the transition from Brawl to SSB4, with the most glaring nerf being the halving of his Pikmin count from six to three. As a result, this hinders his general damage output, as well as his camping potential. However, he also received a few buffs: Winged Pikmin largely outclass Pikmin Chain thanks to being a much more versatile recovery, while his smash attacks using Purple Pikmin have become even more potent. Although the majority of his damage output has been lowered, Olimar has nevertheless retained most of his useful options from Brawl. However, Olimar's buffs do not nearly compensate for his most noticeable nerfs, which has led to him to be considered one of the characters to have been truly nerfed in the initial transition from Brawl, alongside King Dedede, Meta Knight, Falco, Marth, and Jigglypuff. As a result, Olimar is still a viable character, albeit not to the degree as in Brawl. Olimar's design is now a combination of his appearances in Pikmin 3 and Super Smash Bros. Brawl. His slightly smaller nose; helmet's whistle and gray collar; gloves' gray trim; and space suit's red and blue connectors are from Pikmin 3, whereas his space suit's rivets and three connectors are from Brawl. The aesthetic used in SSB4 has also resulted in Olimar's space suit being sleeker, and his boots' red trim; his life support system's stripe; and his gloves and Hocotate Freight patches being more vibrant. Olimar's white and green alternate costumes have been updated. The former's suit is now gray and its gloves are now blue, instead of both being white, while the latter's sleeves and boots are now green instead of white and red, respectively. Instead of receiving new alternate costumes, Alph appears as an alternate character, complete with his own respective alternate costumes. All taunts have updated sound effects. The Pikmin's proportions are now significantly more in line with their appearances in Pikmin 3. Pikmin now have more limited cosmetics, as their leaves do not turn into buds or flowers. Additionally, if two or three Pikmin stand in the same spot in Olimar's lineup, it can produce odd results and make it difficult to tell which Pikmin will be used next. Lastly, their idle animations are all synchronized, presumably to avoid any unnecessary hardware strain. The Pikmin at the head of the line now has a player-colored arrowhead above it. This allows the player to better visualize which Pikmin will be used next. Olimar is lighter (82 → 79). This hinders his endurance. While this would also make Olimar less susceptible to combos, his faster falling speed and the changes to hitstun canceling collectively result in him being more susceptible to combos. Olimar dashes faster (1.4 → 1.47). Olimar falls faster (1.3 → 1.35). This slightly improves his vertical endurance, but makes him slightly more susceptible to combos. Air dodge has decreased start-up lag (frame 4 → 3) and ending lag (frame 40 → 33). Rolls also have less ending lag (frame 33 → 30). Rolls, sidestep, and air dodge have decreased intangibility frames (frames 4-19 → 4-16 (rolls), frames 3-20 → 3-17 (sidestep), frames 4-29 → 3-27 (air dodge)). Sidestep also has more ending lag (frame 26 → 27). Red, Yellow, Blue, and Purple Pikmin have decreased hit points (9 HP → 8 (RY), 14 HP → 11 (B), 15 HP → 13 (P)). Pikmin separated from Olimar also die faster. White Pikmin have increased hit points (4 HP → 7). Due to the limitations of the Nintendo 3DS' processing power, the maximum Pikmin count has been halved (6 → 3). Pikmin have somewhat flawed artificial intelligence. As a result, they can potentially fly out of line if Olimar moves too quickly, which prevents combos or follow-ups from being performed effectively. However, this is significantly less prevalent in the version, as their flawed AI only occurs at edges. Pikmin are now plucked in a set cycle (Red → Yellow → Blue → White → Purple), instead of being random and based on terrain. This means Olimar no longer has to depend on certain types of terrain in order to pluck certain Pikmin. However, this also makes it significantly less frequent to have two or more of the same type of Pikmin at once. Olimar has a new neutral attack, the Rocket Fist's one-two combo. Compared to the previous neutral attack, it has a shorter duration (frames 4-7 (hit 1)/frames 8-10 (antenna)/frames 4-6 (hit 2) → frame 4 (hit 1 clean)/frame 5 (hit 1 late)/frames 4-5 (hit 2)). Unlike the previous neutral attack, it lacks a hitbox on Olimar's antenna, and its second hit does not have the potential to hit point-blank opponents twice. It also has vertical hitboxes (361° → 80°) making it more difficult to jab lock] with it. Neutral attack deals less damage (8.4%-15.75% → 6%-8%) compared to the previous neutral attack, making it capable of combos at low to medium percents. It also has more range, making it more effective for spacing in spite of its lower damage output. Olimar has a new forward tilt, the Rocket Fist's wind-up punch. Compared to the previous forward tilt, it deals 5% more damage (6% → 11%), making it capable of KOing despite its lower knockback (10 (base), 130 (scaling) → 35/97) and better for spacing. It also has less ending lag (frame 38 → 36). Forward tilt has more start-up lag (frame 9 → 15) with a shorter duration (frames 9-18 → 15-17) compared to the previous forward tilt. Due to consisting of six hits instead of eight nd with the multi hits dealing less damage (1% → 0.6%), up tilt deals less damage (11% → 7.6%) without compensation on the final hits knockback. It also has increased ending lag (frame 40 → 44) and a shorter duration (frames 6-20 → 6-16). The weakening of SDI makes up tilt significantly more difficult to escape from. Down tilt's antenna hitbox has been removed, which decreases its overall damage output by 2% (8% → 6%). The changes to hitstun canceling improves down tilt's combo potential. Dash attack has increased ending lag (frame 35 → 38) and a shorter duration (frames 8-14 (hit 1)/frames 10-14 (hit 2) → 8-10/11-14). White Pikmin-based smash attacks deal more damage (9% (clean)/6% (mid)/3% (late) → 11.6%/8%/4.8% (forward), 9% (clean near)/7% (clean far)/5% (late) → 10.4%/8%/8.8% (up), 6% (clean)/4% (late) → 8.8%/7.2% (down)). All of Olimar's smash attacks can now be reflected hindering their reliability against certain characters. Forward smash has decreased knockback, slightly hindering its KO potential. Forward smash has increased horizontal range. When used on an upward slope, Pikmin also now fly parallel to the slope, instead of directly into it. Forward smash no longer makes Pikmin fly off-stage. This conserves Pikmin, but removes their gimping potential. Clean Red, Yellow, and Purple Pikmin-based forward smashes deal more damage (15% → 17.4% (R), 13% → 14.5% (Y), 18% → 20.3% (P)) although their knockback was compensated. Clean Blue Pikmin-based forward smash deals 0.5% less damage (15% → 14.5%). Forward smash has a much shorter duration (frames 11-47 → 11-29). The 19% damage increase to shields and the increase to shieldstun significantly improve clean Purple Pikmin-based forward; clean up; and down smash attacks' shield pressuring potentials. Up smash has increased start-up (frame 8 → 12) and ending lag (frame 33 → 56). It also has decreased vertical range. The removal of DACUS significantly hinders up smash's approach potential. Up smash animation has changed. Clean near and late Red Pikmin-based up smash deals more damage (15% (clean near)/12% (late) → 15.6%/13.2%). Clean near Yellow Pikmin-based up smash deals 1% less damage (14% → 13%). Clean near and clean far Blue Pikmin-based up smash deals less damage (15% (clean near)/13% (clean far) → 13%/10%). Clean far Red and Yellow Pikmin-based up smash deal 2% less damage (14% → 12%). Late Yellow Pikmin-based up smash deals 1% more damage (10% → 11%). Purple Pikmin-based up smash deals more damage (16% (clean near)/13% (clean far)/13% (late) → 18.2%/14%/15.4%). Red and Purple Pikmin-based down smashes also deal more damage (13% (clean)/10% (late) → 13.2%/10.8% (R), 15% (clean)/12% (late) → 15.4%/12.6% (P)). Clean Blue Pikmin-based down smash deals 1% less damage (12% → 11%). Due to consisting of five hits instead of six, neutral aerial deals 4% less damage (12% → 8%) with no compensation on the final hit's knockback. It also has increased ending lag (frame 42 → 54). Neutral aerial has a longer duration (frames 7-22 → 7-24). The weakening of SDI makes neutral aerial significantly more difficult to escape from. Red, Yellow, Blue, and Purple Pikmin-based forward aerials deal less damage (15% → 10.2% (R), 12% → 8.5% (Y), 13% → 8.5% (B), 14% → 11.9% (P)). White Pikmin-based forward aerial deals 1.8% more damage (5% → 6.8%). Up aerial now consists one hit, instead of seven. This significantly improves its KO and juggling potential, but significantly hinders its damage racking potential (24% → 10.8% (R), 16% → 9% (Y), 22% → 9% (B), 9% → 7.2% (W), 22% → 12.6% (P)). Up aerial has a shorter duration (frames 8-20 → 8-15) and has much less range and priority. Sweetspotted Red, Yellow, Blue, and Purple Pikmin-based down aerials deal less damage (16% → 10.8% (R), 12% → 9% (Y), 13% → 9% (B), 13% → 12.6% (P)). Down aerial has a shorter duration (frames 9-29 → 9-15). The removal of meteor canceling significantly improves sweetspotted down aerial's reliability. All grabs have decreased start-up lag (frame 11 → 10). All grabs have shorter durations (frames 11-25 → 10-19) and standing and dash grabs have increased ending lag (frame 30 → 50 (standing), frame 40 → 53 (dash)). Red and Blue Pikmin-based forward throws deal less damage (6% → 5.6% (R), 13% → 11.2% (B)). White Pikmin-based forward throw deals 1% more damage (6% → 7%). Back and up throws have decreased knockback, hindering Blue Pikmin-based back and up throws' KO potentials. Red, Blue, and White Pikmin-based back throws deal more damage (7% → 7.2% (R), 14% → 14.4% (B), 6% → 9% (W)). Red, Yellow, and Purple Pikmin-based up throws deal less damage (9% → 6.4% (R), 11% → 8% (YP)) hindering their KO potential. Purple Pikmin-based up throw is no longer the strongest up throw in the game and it now has less KO potential than Blue Pikmin-based up throw. Blue and White Pikmin-based up throws deal more damage (12% → 12.8% (B), 6% → 8% (W)). Red Pikmin-based down throw deals 2.4% less damage (9% → 6.6%). When coupled with the changes to hitstun canceling, this significantly improves its combo potential at low to high percents. Blue, White, and Purple Pikmin-based down throws deal more damage (12% → 12.2% (B), 6% → 7.8% (W), 8% → 8.4% (P)). When coupled with the changes to hitstun canceling, this improves their combo potentials at low to medium percents, but hinders their combo potentials at high percents. Olimar has a new edge attack, a punch from the Pikmin series. Compared to the previous edge attack, it deals less damage (8%/10% → 7%). Using Pikmin Pluck while near the edge will no longer propel Pikmin over the edge, significantly improving its reliability. Pikmin Pluck has updated sound effects. Pikmin Throw has increased range. This improves its zoning potential, but makes Pikmin more susceptible to being thrown off-stage. Pikmin Throw can now enable Pikmin to latch onto a Smash Ball and carry items to Olimar. The 19% damage increase to shields and the increase to shieldstun significantly improve Pikmin Throw's shield pressuring potential. Pikmin Throw deals less damage both when thrown (9% → 7.8% (R), 7% → 6.5% (YB), 6% → 5.3% (W)) and when latched (2% → 1.1% (RYB), 6% → 3.7% (W). This significantly reduces its damage racking potential especially considering Olimar's reduced maximum Pikmin count. Olimar has a new up special, Winged Pikmin. Unlike Pikmin Chain, Winged Pikmin are a maneuverable, flight-based recovery that cover significantly more distance and allow Olimar to attack while they are carrying him, similarly to Wings of Icarus. Additionally, they can be used regardless of whether or not Olimar has Pikmin. Lastly, they have less ending lag (frame 65 → 31). Altogether, these traits make them significantly safer and significantly more versatile. Unlike Pikmin Chain, Winged Pikmin do not deal damage and cover overall less distance if they are used consecutively. Compared to Pikmin Chain, Winged Pikmin are more effective when he has less Pikmin, and less effective when he has more Pikmin. Pikmin Order has decreased super armor frames (frames 2-16 → 6-12), significantly hindering its safety. Pikmin Order's animation has slightly changed. Olimar's hand no longer goes through his helmet when he whistles. End of Day deals less damage (15% → 10% (ascent), 43% → 15% (Red Bulborbs), 15%/20% → 12%/10% (explosion)). The Hocotate Ship also has decreased knockback, significantly hindering its KO potential. The Hocotate Ship can be maneuvered during its descent, similarly to a Warp Star. Its explosion also has a larger hitbox. Olimar has received a mix of buffs and nerfs from game updates. Update 1.0.4 made Pikmin Pluck unable to be edge-canceled and decreased the amount of damage that Red, Yellow, and Blue Pikmin deal when they latch onto opponents. To compensate for this, White Pikmin deal more damage when latched on, and the latch time for Red, Yellow, Blue, and White Pikmin has increased. However, Olimar also significantly benefits from the changes to shield mechanics brought about by updates 1.1.0 and 1.1.1. This is thanks to latched Pikmin becoming better at damaging an opponent's shield, while the low ending lag on his smash attacks makes them even less punishable on shield, thanks to the increased shieldstun. As a result, Olimar is very slightly better than he was during SSB4's initial release. Neutral, forward, and back aerials' landing lag decreased: 17 frames → 15. Pikmin Pluck can no longer be edge-cancelled. Red, Yellow and Blue Pikmin latched onto opponents deal less damage: 1.3% → 1.1%. White Pikmin latched onto opponents deal more damage: 2.6% → 3.7%. Purple Pikmin thrown deal less damage: 6.5% → 6%. Pikmin Throw's latch time increased by 100 frames. Fixed a glitch where reflecting Order Tackle would give the Pikmin a permanent power boost. Fixed a glitch where Pikmin Order no longer reverses from edge grabs. All Pikmin-based moves and grabs use the next Pikmin in the line to perform the given attack. Upon performing a move, that Pikmin goes to the back of the line. 3% (arm), 4% (fist) The Rocket Fist's one-two combo. It has very minimal start-up and ending lag, average knockback growth, and its second hit launches at 45°. Altogether, these traits enable it to act as a very reliable pseudo-jab cancel, with follow-ups including a grab at low percents, and Pikmin Throw or a dash grab at medium percents. These traits also make it capable of starting a tech-chase at high percents. Performing it repeatedly will also slightly move Olimar forward. 11% The Rocket Fist's wind-up punch. It is powerful for a tilt attack, thanks to its decent damage output and high knockback growth. It KOs middleweights at 132%/120% (3DS/Wii U) while near the edge of Final Destination. Due to it hitting on frame 15, however, it is very punishable and has the highest amount of start-up lag out of his entire moveset. In addition, it is Olimar's only KOing option when he does not have any Pikmin. 0.6% (hits 1-6), 4% (hit 7) A jumping twirl. It hits on frame 6, has decent vertical range, and hits multiple times, with its last hit having very high knockback growth. Altogether, these traits make it a decent anti-air attack. 6% A sliding tackle. It hits on frame 6, and has very low base knockback, very high knockback growth, and minimal ending lag. Altogether, these traits make it a reliable combo starter at low to medium percents. It can combo into itself (especially on fast-fallers), up tilt, smash attacks, and aerial attacks, depending on the opponent's DI. It can also interfere with an opponent's edge grab attempt, thanks to its hitbox being capable of going below the edge. Like neutral attack, performing it repeatedly will slightly move Olimar forward. 7% (hit 1), 4% (hit 2) A cartwheel. It can function as a mix-up, as it is able combo into up aerial at 0%-10%. However, its second hit's very low damage output, high base knockback, and low knockback growth collectively make it unable to combo past very low percents, or KO at reasonable percents. P: 20.3% (clean), 14% (mid), 8.4% (late) Points forward to command a Pikmin to leap forward and perform a corkscrew tackle. Due to it hitting on frame 11, it is the second fastest forward smash in the game. It is also Olimar's most damaging smash attack, has minimal ending lag, and boasts impressive power even while using Yellow or Blue Pikmin. Clean Purple Pikmin-based forward smash KOs middleweights at 80%/73% (3DS/Wii U) while near the edge of Final Destination. It also has a slight chance to trip opponents. However, it only KOs reliably while using Red, Yellow, Blue, and Purple Pikmin at close range. P: 18.2% (clean near), 14% (clean far), 15.4% (late) Points upward to command a Pikmin to jump and perform a cartwheeling tackle. Due to hitting on frame 12, it has decent start-up lag for a smash attack. It also boasts impressive power even while using Yellow or Blue Pikmin. Clean near Purple Pikmin-based up smash KOs middleweights at 94%/87% (3DS/Wii U) from anywhere on Final Destination. However, it has the highest amount of start-up lag out of his smash attacks, and its 33 frames of ending lag is the highest out of his smash attacks. In addition, it only KOs reliably while using Red, Yellow, Blue, and Purple Pikmin at point-blank range. P: 15.4% (clean), 12.6% (late) Squats slightly and points to both of his sides to command two Pikmin to perform dashing tackles. Due to it hitting on frame 10, it has decent start-up lag for a smash attack. It also has a chance to trip opponents and, if the opponent is close enough to Olimar, both Pikmin can hit them. Clean Purple Pikmin-based down smash KOs middleweights at 124%/114% (3DS/Wii U) while near the edge of Final Destination. Due to being his least damaging smash attack, however, it has lower KO potential compared to forward/up smashes. In addition, its Purple Pikmin-based late hit has much less knockback and a noticeably shorter duration. 1.5% (hits 1-4), 2% (hit 5) A jumping twirl. It is a reliable combo starter at low to high percents when SHFF'd, as it can combo into neutral attack; up/down tilts; down smash; and a grab. It is also Olimar's only aerial that does not have low priority. However, it lacks KO potential like his other aerials. P: 11.9% Grabs a Pikmin by its stem and swings it downward in front of himself. It is a very reliable follow-up from down throw, and is useful for approaching when SHFF'd or for edge-guarding. However, it has low priority. P: 15.12% Grabs a Pikmin by its stem and swings it upward behind himself. It is Olimar's most damaging aerial, and a viable KOing option with Red or Purple Pikmin. Purple Pikmin-based back aerial KOs middleweights at 111%/101% (3DS/Wii U) while near the edge of Final Destination. Due to it hitting on frame 10, however, it has the highest start-up lag out of his aerials. It also has low priority. P: 12.6% Grabs a Pikmin by its stem and twirls it upward. It is tied with down aerial as his second most damaging aerial, and is a viable KOing option. Purple Pikmin-based up aerial KOs middleweights at 105%/97% (3DS/Wii U) while near the upper blast line of Final Destination. However, it has a noticeable amount of landing lag and low priority. P: 12.6% Grabs a Pikmin by its stem and swings it downward. It is tied with up aerial as his second most damaging aerial. It is also a meteor smash, but only against aerial opponents and during its first frame. However, it has a noticeable amount of landing lag and low priority. — Points forward to command a Pikmin to grab the opponent. The Pikmin function as disjointed grabs, and Olimar's overall grab range varies depending on the Pikmin used. White Pikmin have the longest range, and notably grant Olimar the fourth longest ranged standing grab in the game. Red, Yellow, and Blue Pikmin grant him the sixth longest ranged standing grab in the game. Lastly, Purple Pikmin have the shortest range, but nevertheless grant Olimar the tenth longest ranged standing grab in the game. W: 4% The Pikmin strikes the opponent with its stem. It has average speed, but when used with White Pikmin, its damage output is tied with Shulk's Buster-boosted pummel for the most damaging pummel in the game. B: 11.2% The Pikmin shoves the opponent away. It is Olimar's least useful throw, as its only utility consists of dealing damage. B: 14.4% Olimar and the Pikmin turn around and the Pikmin performs a body slam. It deals the most damage out of all of Olimar's throws and launches at 45°. These traits make it capable of KOing while using Blue Pikmin, and decent for setting up an edge-guard at high percents with non-Blue Pikmin. Blue Pikmin-based back throw KOs middleweights at 161% while near the edge of Final Destination in Super Smash Bros. for Nintendo 3DS. B: 12.8% The Pikmin jumps up, turns upside down, and performs a modified piledriver. Although its knockback has decreased since Brawl, it is still one of the strongest up throws in the game while using Blue Pikmin. Blue Pikmin-based up throw KOs middleweights at 157%/146% (3DS/Wii U) from anywhere on Final Destination. P: 1.4% (hit 1), 7% (throw) The Pikmin pins the opponent to the ground and then jumps to perform a downward battering ram. It is Olimar's best combo starter, especially while using Red Pikmin. Red Pikmin-based down throw can combo into neutral aerial at 0% to low percents; forward and reverse aerial rushed back aerials at 0% to high percents; and up aerial at low to high percents. One particularly notable combo is a Red Pikmin-based down throw followed by a Purple Pikmin-based back aerial, which is a true combo that KOs reliably while near the edge. Red Pikmin-based down throw can also combo into forward tilt and forward smash at 0% to low percents, albeit only against fast-fallers. Yellow, Blue, White, and Purple Pikmin can also perform these combos, but their combo potential wanes considerably past medium percents because of their throw-based damage multipliers being much higher than the Red Pikmin's. 7% Punches in front of himself and then behind himself while getting up. 7% Headbutts in front of himself and then behind himself while getting up. 5% Headbutts in front of himself and then spins around to perform a double-footed back kick behind himself. 7% Throws a punch while climbing up. Default Pikmin Pluck — Plucks a Pikmin. It cannot be used in midair, and has noticeable ending lag if it is attempted in midair, or if no more Pikmin can be plucked. Custom 1 Hardy Pikmin Pluck — Pikmin have much more hit points and knockback resistance, but take much longer to pluck. P: 10% Each pluck detonates an explosion, but Pikmin take longer to pluck and have less hit points. W: 3.7% (latched) Throws a Pikmin, which latches onto opponents and damages them before falling off either because of flinching, the opponent's damage, or being killed. In regard to the opponent's damage, a Pikmin's latch duration decreases when the opponent's damage increases, even when undisturbed. When undisturbed, Pikmin can stay latched on for a maximum of 6 seconds (360 frames) from 0%-49%; a maximum of 5 seconds (300 frames) from 50%-99%; a maximum of 4 seconds (240 frames) from 100%-149%; a maximum of 3.5 seconds (210 frames) from 150%-349%; and a maximum of 1 second (60 frames) from 350%-999%. Due to the Purple Pikmin's inability to latch onto anything like in their home series, they will instead deal damage on contact. On a related note, if the target cannot be latched onto, any non-Purple Pikmin simply deal damage. W: 2% (latched) Pikmin hit faster and remain latched on longer. However, the distance Pikmin are thrown is considerably shorter, and latched Pikmin deal less damage per hit. P: 8% All thrown Pikmin act like Purple Pikmin and tackle opponents instead of latching onto them. Red, Yellow, Blue, and White Pikmin deal less damage, but Purple Pikmin deal more damage. Default Winged Pikmin — Two Winged Pikmin carry Olimar around. Winged Pikmin's effectiveness is dependent on both the amount of Pikmin that Olimar has, and the frequency of its usage. Having no Pikmin in tow allows them to travel almost across the entirety of Final Destination, one Pikmin in tow allows them to travel over 80% of Final Destination, two Pikmin in tow allows them to travel slightly over 50% of Final Destination, and three Pikmin in tow allows them travel over less than 50% of Final Destination. In regard to frequency, it takes approximately 3 seconds (180 frames) for Winged Pikmin to be able to travel the same distance again after the conclusion of the initial usage. Olimar can also use his aerial attacks while being carried, similarly to Wings of Icarus. However, doing so will render him helpless immediately after the conclusion of the aerial. Custom 1 Winged Pikmin Jump — Functions like a traditional recovery by lacking the maneuverability in order to quickly lift Olimar upward a certain distance before falling. The Winged Pikmin also push away nearby opponents. Custom 2 Mighty Winged Pikmin — The distance traveled does not depend on Pikmin carried, but the Winged Pikmin follow a fixed distance regardless of the amount of Pikmin in tow. Default Pikmin Order — Blows his whistle to recall Pikmin and/or sort out their order in the line. It also grants super armor on frames 6-12. P: 5% Pikmin recalled deal damage, but the whistle has a fair amount of ending lag. Custom 2 Dizzy Whistle 0.1% (hit 1), 1% (hit 2) Deals damage and reverses opponents within the whistle's range, but has a noticeable amount of start-up lag. End of Day 10% (launch), 10% (ascent), 15% (Red Bulborbs), 10% (descent), 12%/10% (explosion) Jumps into the Hocotate Ship and launches into outer space, which buries any nearby opponents. While the ship has left the stage, Red Bulborbs attack opponents to steadily inflict damage. The Hocotate Ship then descends from outer space, and explodes upon crash landing onto the stage. Its KO potential has significantly worsened since Brawl, but it is still fairly strong, as its most damaging explosion is strong enough to KOs middleweights at 70% while near the edge of Final Destination in the 3DS version. Although its least damaging explosion deals slightly less damage, it has significantly less knockback. The Hocotate Ship can also be maneuvered during its descent, similarly to a Warp Star. However, it is actually possible for Olimar to inadvertently self-destruct if he descends towards the lower blast line. Exits the Hocotate Ship and then plucks three Pikmin, after which the Hocotate Ship disappears in a puff of smoke. Up taunt: Joyfully jumps in place three times. Side taunt: Lies down on the ground, rolls around as if basking in nature, and then gets up. Moves his arms back and forward in a basic limber exercise. Olimar! Olimar! Olimar! Pik-min! Ol-i-mar! Alph! Alph! Alph! Pik-min! Al-ph! A remixed excerpt of Pikmin's title screen theme. Plucks a White, Blue, and Purple Pikmin. The White Pikmin and Blue Pikmin bounce off Olimar's head, whereas the Purple Pikmin squashes him onto the ground. Olimar's eyes will comically bulge outward upon being squashed before his expression returns to normal, whereas Alph will comically wince upon being squashed before his expression returns to normal. Performs a toe touching exercise while a Yellow Pikmin rests on the ground and a Red Pikmin looks around. Sways in place while a Red, Yellow, and Blue Pikmin walk around him in a circle. Angbad - Placed 25th at CEO 2016; 33rd at Paragon Los Angeles 2015 and 33rd at EVO 2016; and 49th at Apex 2015. Coco - Placed 2nd at Combo Breaker 2015 and 13th at The Big House 5 in doubles play. Formerly ranked 7th on the Michigan Power Rankings. Dabuz - The best Olimar player in United States and one of the two best ones in the world. Placed 1st at WTFox 2, Aftershock 2016, and Smash Valley; 2nd at Apex 2015 and Super Smash Con 2016; 3rd at CEO 2016; 4th at Frostbite 2017; 5th at EVO 2015 and The Big House 6; and 7th at GENESIS 4. Gomakenpi - The best Olimar player in the Midwest. Placed 33rd at Midwest Mayhem 11 and 9th at Chronicles of Olympus II. Also ranked 4th on the Michigan State University Power Rankings. Has taken a set off of Marss. GreenBeast - Placed 7th at Midwest Mayhem and 13th at Smash 'N' Splash. ImHip - Placed 9th at Final Battle; 17th at Paragon Los Angeles 2015 and 2GGC: GENESIS Saga; and 33rd at 2GGC: Midwest Mayhem Saga and 2GGC: Civil War. Ranked 15th on the SoCal Power Rankings. Klaatu - Placed 17th at 2GGT: Abadango Saga; 25th at 2GGC: Greninja Saga; and 33rd at 2GGT: Mexico Saga and 2GGT: ZeRo Saga. Krow - Placed 2nd at Full Bloom 2; 17th at Midwest Mayhem 4; and 25th at Midwest Mayhem 3. Ranked 5th on the Indiana Power Rankings. Logic - Placed 7th at PAX Prime 2015; 9th at Smash 'N' Splash and Enthusiast Gaming Live Expo; 17th at Royal Flush; 25th at Super Smash Con 2015; 33rd at CEO 2015; and 49th at EVO 2016 and Super Smash Con 2016. Formerly ranked 15th on the MD/VA Power Rankings. Myran - Considered one of the best Olimar players in the world. Placed 5th at Paragon Los Angeles 2015; 17th at Frame Perfect Series 2 and 2GGC: Nairo Saga; 25th at CEO 2015 and Frostbite 2017; and 33rd at Apex 2015 and CEO 2016. Shuton - The best Olimar player in the world. Placed 1st at Sumabato 15; 3rd at Sumabato 14 and 2GGC: West Side Saga; 5th at Frostbite 2017; 9th at Umebura S.A.T. ; and 13th at 2GGC: Civil War. Ranked 4th on the JAPAN Power Rankings. Syco - Placed 25th at Midwest Mayhem 6: SoCal Invasion and Naifu Wars: World War 1. Ranked 6th on the Ohio Power Rankings. Like in Brawl, Olimar's placing in SSB4 was one of the most contentious among the cast. At first, players would deem his nerfs as being too harsh for him to even be assessed as a mid-tier character, with some even considering him to be a bottom-tier character. This perception would remain intact for several months until players soon started to demonstrate Olimar's retained strengths, with professionals like Dabuz, ImHip, Shuton, and Soulimar achieving good tournament results. As a result, Olimar was ranked 24th on the first tier list. Despite this, Olimar's tournament representation and results have never been as bountiful as other characters'. To reflect this, he dropped 30th on the second tier list. After Dabuz and Shuton brought about improvements to Olimar's results, however, he rose to 27th on the third, then to 21st on the fourth and current tier list. Although he is not as overwhelmingly effective as he was in Brawl, Olimar has nevertheless managed to remain a viable pick in competitive play. A veteran spaceship pilot for Hocotate Freight, Captain Olimar partners with Pikmin in Smash Bros. to help him in battle. Olimar is much stronger when he's got Pikmin with him, so keep them plucked and good to go. Pikmin abilities are based on their color—learn what each is best at! Captain Olimar, veteran Hocotate Freight astronaut, joins forces with Pikmin again in this game to take on the world. Olimar isn't much of an attacker without Pikmin by his side, so you should always keep some ready. Pikmin have different abilities depending on their colour, so learn how they work to use them effectively! Pikmin aren't just good for attacking, you know. For example, when you throw them, they can pick up items on their way back. Only items that aren't very heavy, though! Also, if there's someone charging or shooting at you, a well-timed Pikmin throw can stop them in their tracks! Pikmin aren't just good for attacking, you know. For example, when you throw them, they can pick up items on their way back. Only items that aren't very heavy, but still! Also, if there's someone charging or shooting at you, a well-timed Pikmin throw can stop them. Just don't forget to replace your Pikmin when they're gone! On the planet Olimar is investigating, the native creatures become extra violent at night, forcing him to retreat to orbit every evening. His Final Smash works the same way: night falls and Olimar takes to the sky, leaving his foes to the mercy of the wildlife below. Olimar returns when dawn breaks and you can adjust his less-than-safe landing! On the planet of the Pikmin, the native creatures get quite violent come nightfall, so Olimar retreats into orbit every evening. That's how his Final Smash works, too: Olimar takes off in his trusty Dolphin[sic], then in comes the beasties to take care of the other fighters. When Olimar returns, make sure he touches down, er...safely! A Battle of Scale: A tiny Olimar must defeat a giant Bowser. All-Star Battle: Brawl: Olimar is one of the opponents fought in this event. All of the opponents debuted in Brawl. The Big 7650! : As Pac-Man, the player must use his Final Smash, Super Pac-Man, on three Olimars within 15 seconds. Poisonous Planet: Olimar and Samus must defeat two giant Charizard in a Stamina Battle before their own health is depleted via flowering. Solidarity: Olimar and Rosalina & Luma must defeat Mario and Luigi, and then defeat Bowser and Bowser Jr. Visiting Onett: Ness and Villager must defeat Olimar, Kirby, Meta Knight, Fox, Falco, and Rosalina & Luma. All of the opponents are outer space-based characters. 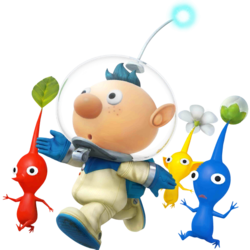 Instead of alternate color schemes, half of Olimar's alternate costumes consist of Alph, one of the three leaders from Pikmin 3. Olimar in the Nintendo Direct from April 8th, 2014. The Pic of the Day revealing Olimar's return to the series and commemorating Pikmin 3's Japanese launch. Olimar using a White Pikmin-based forward smash on Mario in Super Smash Bros. for Wii U.
Olimar alongside Link in Super Smash Bros. for Nintendo 3DS. Using a Red Pikmin-based forward smash on Fox. Using a White Pikmin-based back aerial on Mega Man. Using a Red and Purple Pikmin-based down smash on Pit and Link. Red, Yellow, and White Pikmin. Olimar dashing away from Bowser while the spirit of a deceased Blue Pikmin is visible. White, Blue, and Yellow Pikmin looking up at Kirby. White, Red, and Purple Pikmin alongside a supine Mega Man. A closeup of a Yellow Pikmin, Olimar's whistle, and his space suit's Hocotate Freight patch. Using his forward smash alongside Wii Fit Trainer's forward smash. Alongside Sonic and a Hocotate Bomb. Using Winged Pikmin, his new up special. Alph alongside a Red, Blue, and Yellow Pikmin. Due to a glitch, the latter two Pikmin's models have become meshed. Because Olimar's placement in All-Star Mode is based on his own debut instead of Alph's, whose debut in Pikmin 3 occurred twelve years after Olimar's debut in Pikmin, Alph will be misplaced chronologically during All-Star Mode if he appears in Olimar's place. The same applies to Bowser Jr. and the Koopalings. Olimar's All-Star trophy in Super Smash Bros. for Nintendo 3DS is highly similar to his pose in his official artwork for Brawl. Olimar is the only character who does not use his official alt. trophy when he is faced in rounds 4-5 in Classic Mode in Super Smash Bros. for Wii U. Instead, he uses Alph's trophy. Although Alph travels in the S.S. Drake in Pikmin 3, he instead travels in the Hocotate Ship for his on-screen appearance and Final Smash because of his status as an alternate costume. Olimar and Alph have different expressions when they are hit. Olimar's eyes comically bulge out, which he commonly does in Pikmin 2 upon being surprised, whereas Alph winces. Olimar is the only character to have only one special move in his default moveset that deals damage. He is also the only character to have a special move (Winged Pikmin in his case) that lacks any damage-dealing custom versions. In the European version of End of Day's trophy, it mistakenly says that Olimar pilots the S.S. Dolphin during it. However, he actually pilots the Hocotate Ship during End of Day. Despite Pikmin Throw's ability to make thrown Pikmin bring items to Olimar being exclusive to Super Smash Bros. for Wii U, his alt. trophy in Super Smash Bros. for Nintendo 3DS mentions it regardless. This page was last edited on February 25, 2019, at 14:33.